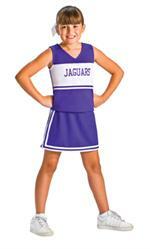 Cheer Kids cheerleading uniforms are adorable! Chosen by youth leagues and schools all over the country. Cheer Kids outfits are designed for young girls so they are perfect for Pop Warner cheer squads and similar youth football league cheerleaders. Cheer Kids "Quick Ship" outfits take about 2-3 weeks, possibly longer in late summer/fall and during holidays, and your team name will be embroidered for free! Items marked "Custom Made" take about 4-6 weeks - please plan ahead! These can't be rushed! Can't wait 2-3 weeks or have larger/older girls? Check out our In Stock Cheer Uniform section or contact us for recommendations.